The new routes will link Toronto Pearson International Airport with Budapest, Prague, Warsaw, and Glasgow; and Montreal Trudeau International Airport with Casablanca on Morocco’s west coast. Air Canada is expanding its North American route network by adding eight non-stop routes in its summer 2015 schedule, as well as increasing capacity on two other routes. Four will be operated by regional-airline partner Jazz Aviation LP and four by Air Canada rouge. Air Canada will expand use of its new Boeing 787 Dreamliner fleet from Vancouver International Airport in early 2015, introducing the type on its routes to Beijing and Seoul from the British Columbia city. Air Canada will launch year-round mainline service to Amsterdam from Toronto next June to expand its international network. Additions to the airline’s summer 2015 network also include new Air Canada rouge seasonal service from Montréal to Venice and between Vancouver and Osaka. This spring Air Canada’s leisure-carrier subsidiary, Air Canada rouge, is taking over eight routes previously operated by Air Canada from Toronto and Montreal to Cuba, the Dominican Republic, The Bahamas, Barbados, Haiti, Cancun and Tampa. Montreal-based Air Canada has secured commitments, options and rights to purchase up to 109 Boeing 737 MAX aircraft. The new Boeing 737 MAX jets will replace Air Canada’s existing mainline fleet of Airbus A320-family narrowbodies and at least 20 of its Embraer 190s. Air Canada rouge has launched year-round service between Toronto and Orlando, offering three daily round-trips on a 365-day basis. The Air Canada group of carriers is expanding its international services to Europe from Toronto, Montréal, Vancouver and Calgary in its summer 2014 Europe schedule. In addition to the 14 routes which Air Canada’s new leisure-airline brand will serve from July 1, Air Canada rouge will add seasonal flights operating from October through March to another 13 sunspot destinations in the Caribbean, Mexico, Florida and Southwestern U.S. for “snowbird” winter-season leisure travelers. 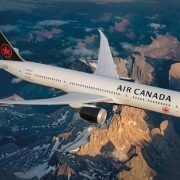 The five Boeing 777-300ER jets – due for delivery in June, August, November and December of this year, with the last coming in February 2014 – will be the first aircraft configured with Air Canada’s new Premium Economy cabin.